I have some significant news. Last weekend Toby had his 30th set of scans at the nuclear medicine wing of Memorial Sloan-Kettering Hospital. He was injected with radioactive dye on Friday and came home with a special disclaimer that warned us not to travel near airports or government buildings because he might set off security alarms. On Saturday, he was strapped to a room-sized machine for 3 hours, while every inch of his body was scanned and interpreted. He stayed perfectly still while Stephen told him a rollicking Wally Worm story. Yesterday we received the results: Toby is free of disease. Almost 6 years to the day after being diagnosed with metastatic stage 4 neuroblastoma, the doctors cannot find any cancer cells in Toby's body. After crying and hugging and giving thanks, a brave new world opens up before us. After 6 years of fighting and subjecting this little boy to every possible variation of hell, we pause. So what does this all mean? It means that instead of getting scans every 3 months, we move to a 6 month schedule. It means that we deal with the effects of treatment rather than the treatment itself. And it means that we give thanks to all of you, for being the most amazing caring community of friends and colleagues we can imagine. We would not have gotten here without you. It also means that we dedicate ourselves to caring for others who are still in the trenches. Just two months ago a little boy from our neighborhood was also diagnosed. He and his family are in the worst of it now. Speaking with his mother brings me back to the intensity of April 17, 2007 when the doctors told us "Your child has a tumor. It has spread. And we need you to know that he may die." On May 11 Toby will be walking with us and his friends in Central Park to raise money for pediatric cancer research at Memorial Sloan-Kettering Cancer Center. Kids Walk for Kids with Cancer is an annual event that gives 100% of raised funds to doctors and researchers at MSK. Last year we formed a TEAM TOBY and raised an amazing $10,000 in just a few short weeks. These funds are vital to survival: cancer kills more children than any other disease. Every 16 hours a child with neuroblastoma dies. And lack of research dollars bars the way to a potential cure. By getting sponsors and walking or just by donating, you can help to level the playing field and give our children a chance at life. We are hoping to organize an even bigger TEAM TOBY by encouraging friends and colleagues to join the walk and/or donate. The event starts at 1:30 pm and will be a 4.5 mile walk followed by cookies and socializing. Everyone from babies in strollers to grandparents and even pets are welcome! Last year we had a great time!!! How wonderful would it be to show our kids that by walking together we can make a difference in the lives of so many. And what better weekend can it be than Mother's Day to share this gift of support and love... and celebrate our own children's health. That is fantastic news! Our family celebrates with yours. Your blog has been an inspiration as our family deals with the treatment of our 8 month old son Jacob who was diagnosed in January. L'chaim has never meant so much. I am so thrilled to hear the news -- for Toby, for you and for your entire family. Thanks for sharing. Wonderful news!! So very happy for you, your family, and your dear son. May he enjoy many years of exceptional health!!!! I haven't blogged in such a long time, and I'm sorry I missed this post when it was fresh.I am overjoyed an SO grateful to God, and I pray for Toby's continuing good health! Could u please contact me! I just read your blog. What a miracle to such an amazing, caring and giving family! I have never stopped thinking of Toby and praying for him! 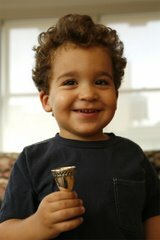 Already at age 4, Toby was an incredibly bright and determined boy with a great sense of humor. I can only begin to imagine how special he is six years later. Unfortunately close family members and children of friend's of mine have been diagnosed with cancer. I have shared Toby's story and your blog with them. Through you, I have learned and tried to be a more supportive,understanding and caring friend and cousin. Thinking of you and praying that Toby is maintaining and enjoying his health.